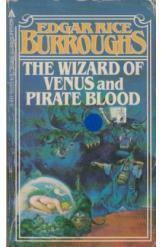 The Wizard of Venus and Pirate Blood Edgar Rice Burroughs Sci Fi. Book is in good condition, all pages intact. Two novels by Edgar Rice Burroughs in a single softcover volume. In "The Wizard of Venus," Carson Napier faces yet another Venusian villain armed with a deadly mixture of science and alien magic. In "Pirate Blood," a reckless scientist discovers that magic and piracy will become his future.